Pinched clay, variable dimensions, 2015-2018. Deathgate is a ceramic installation artwork that presents a tangible handmade object for each person detained in the Auschwitz network of concentration camps: 1.3 million people/pieces. Both the time and labour involved in producing this work is where its conceptual basis is formed. The created objects are comparable to the stones that cover and surround the railway, which was used as the main mode of prisoner transportation into the Auschwitz camps. Using a pinching process and a wide range of clay types, I have created each ceramic ‘stone’ by hand, which consequently leaves a fingerprint on each object. This is intended as both a reductive exercise that references the treatment of those victimised, but also gives evidence to individualised attention for each detainee in order to introduce human sensibility into an overwhelmingly inhumane event. Top and bottom: The pinching process behind creating the ceramic 'stones' (photographs: Hannah Roche). The work displays as two separate lengths of ceramic ‘stones.’ One length containing 1.1 million ‘stones,’ and the other containing 200,000. This will give a direct visual reference to the staggering amount of deaths (1.1 million) against those who survived the Auschwitz camps (200,000). Aesthetically, the installation is reminiscent of the railway leading into the Auschwitz II (Birkenau) extermination camp, which led through the main entrance of the camp, also know as 'the deathgate.' Various elements of the work including my choice of clay types and my method of installation are directly responsive to personal impressions while visiting the Auschwitz camps in January of 2016 (immediately prior to beginning intensive production of the ‘stones’). The ultimate simplicity of the project itself, alongside having prominent elements of the work be representative of my own limited experience, admits to the inherent representational limits of such history. In no way does the work aim or attempt to wholly represent what was experienced by those victimised, but instead, represent the history from a distanced perspective. 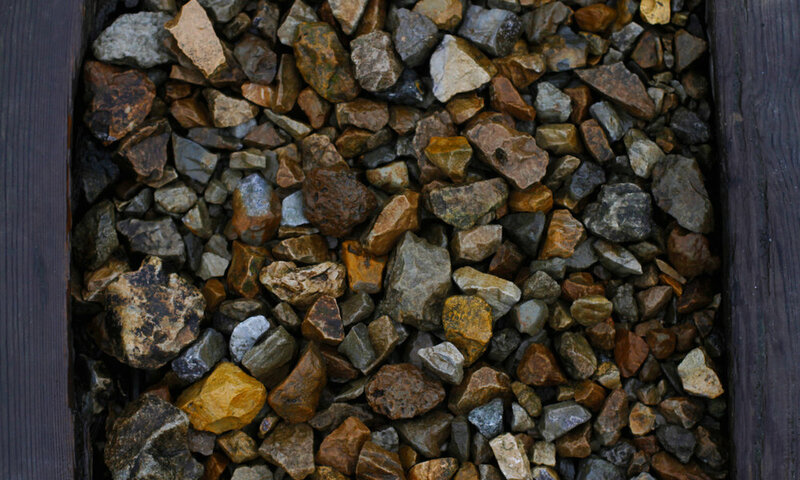 Top: the stones covering and surrounding the actual railway at Auschwitz II (Birkenau) (photograph: Dan Elborne). Bottom: an assortment of Dan Elborne's created ceramic 'stones' (photograph: Dan Elborne). My decision to create ‘stones’ is conscious of a Jewish tradition that involves placing stones on grave-sites. This practice has been interpreted in various ways but is commonly considered as a way to honour those lost through an object which, unlike flowers that wither and die, embodies the permanence of memory and long lasting legacy. Development of this project began during an artist residency at Ateliers Fourwinds in Aureille, France, where I developed an appropriate process, produced the first ‘stones,’ and calculated the logistics of the project. The first ceramic ‘stone’ was produced there on June 28, 2015. Consequently, the project reached absolute completion on November 21, 2018. This production period provides a time-based link to the first gassings (or mass killing) of prisoners at Auschwitz (Wednesday, September 3, 1941) to the liberation of the Auschwitz camps (Saturday, January 27, 1945); meaning that the production of the work itself matches to the mass killings within the Auschwitz camps, 1242 days or 3 years, 4 months and 24 days. A single ceramic 'stone' with the featured fingerprint (photograph: Grace Yu). I intend for the work to not just represent those detained in the Auschwitz camps, but be considered as a relative fraction of the total victims of a largely inconceivable event. The work aims to memorialise the event itself and question the role of art in the legacy of such history, while also broadly speaking of the abhorrence and ongoing nature of prejudice, discrimination and genocide. If anything, the crucial intent of the work is for it to stand as an exercise in empathy, both for myself and viewers alike.